There are so many programs around money that we have been led to believe. So many from early childhood. Most of them not very supportive to us creating the financial abundance we desire. And if you know me, I feel as if we create our entire existence with our thoughts. Either positive or negative. It all falls on what we hold in our minds. But we have the powerful ability to create replace old thoughts with new thoughts. Thoughts that override or condition. It is more like unlearning instead of learning. We were engineered for success, designed for greatness, but programmed to fail. 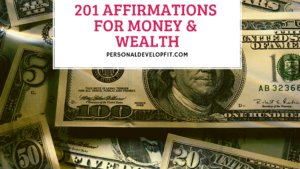 This is all going to be a thing of the past for you when you harness the power of some or all of the affirmations about money that I list out below. Condition your mind with these affirmations on a daily basis. Use them to counteract negative and limiting beliefs about money. Right when they come up, insert into your mind a positive money affirmation before this thought gets away from you. This is where and how we create lack or complete abundance. Below is the beacon of hope for us. Giving us a list of weapons to use against our negative programs. Override these programs. And live out the potential that we have been gifted. Live out the way we have been engineered. And manifest, in a sense, heaven on earth. Read on my friend. To transform the way you see money, FOREVER. I have an abundant mindset around money. I attract money with ease into my life. I have a saving conscious mind to where I save and invest my money wisely. I am constantly attracting people in my life that can help me raise my net worth. I only think positive thoughts about money. I commit to letting go of all my limiting beliefs about money. I am conscious of my thoughts around money and always choose positive and supporting thoughts. I am always building my wealth and net worth. I am embrace the power of investing and seeing my money compound with interest. I know wealth is a mindset so I feed my mind only with things that will help my mind grow. I know the marketplace does not dictate how much I earn, I choose to thrive at all times. My bank account is a direct result of my own thinking. I then have the power to change it drastically. I commit to life long learning about money and investing. Money is at it’s essence energy, therefore I see it as that. Not attached to it. I spend money with the abundant mindset. For what I hoard, I am too attached to. There is plenty of money to go around. I can’t help the poor if I am poor so it is my moral obligation to get rich. Money actually does grow on trees, since it is made of paper. Therefore I do away with this belief. I have all I need within me to manifest as much money as I please. I am always talking to people who are as positive about money as I am. I commit only to engage in relationships that support me getting rich. I know what I seek is seeking me, so money is therefore on my side. I commit to being rich. I will make it happen. I commit to being wealthy in all areas of my life, including my finances. It doesn’t matter what background I come from, I create my own wealth. Because no one has ever become rich in my family, I will be the first one. I have no negative feelings or thoughts around money. I use part of the money I earn to learn more about creating a better relationship with money. I only talk about money positively, because I know what I speak comes into my physical existence. I know God wants me to be rich. I love being rich in all areas of my life. Wealth and riches are my birthright. I become who I hang around so I choose to hang out with rich and rich thinking people. Some of my biggest goals are set around be being financially free. I know I have what it takes to create financial freedom for myself. I am always open and alert for new income opportunities. I hire the best to help me invest my money so I can see the most return on it. Money can buy memories with family and friends, which means that it can buy happiness. Money is very important to me and I treat it so. My mind is fertile with thoughts that support my financial freedom. I only visualize positive results around money and me saving and investing it. I courageously and boldly go after my financial goals. I will do whatever is necessary and ethical to gain riches and become financially free. I don’t judge rich people, I bless them. For what I bless is returned to me. I see rich people as being just like me. I study rich people and implement all I learn about them. If anyone in the world can get rich, that means so can I.
I am smart enough to get and keep my riches. I have the best money mindset of all time. I know that I am blessed and highly favorable for wealth and abundance. I look forward to seeing my riches grow right in front of my eyes. I commit to having the biggest bank account in the entire bank. The more I grow as a person, the more my income can grow. That is why I commit to constant and never ending improvement. I am a natural at making money. People often admire at how good I am with money and how much I give back because of it. I know that I can give more if I earn more, so that is why I know it is imperative to get as wealthy as I become. I love that I able to boost my income whenever I choose. I am a great entrepreneur and can create multiple sources of income whenever I choose. I also teach my good money habits to friends and family because I know teaching reinforces beliefs. Where I am now has nothing to do with where I can go with my wealth. I am constantly becoming more financially free every single day. I use my money to also take care of myself and spend to enjoy my life. Money is simply just paper. No need to have any negative beliefs around it. I do not allow negative people to influence how I think about money. I reinforce my positive thoughts about money with repetition every day. My mind is constantly seeking ways to help me become rich and wealthy while I sleep. I use the law of attraction with ease to become rich. I think and then act in accordance to creating abundant cash flow in my life. I think, therefore I am. That is why my thoughts are always about how I am and becoming wealthy. There is no truth but the power I give it. That is why I only see truth in things that will help me become and stay wealthy. I am not attracted to get rich schemes, only endeavors that will help me create and keep wealth the right way. I come from an all loving and abundant God who wants and supports me being rich. I know that being poor is not noble, it is selfish because then I can’t give. Money is like a current that moves towards me at all times. I know that hard work doesn’t mean more money, I work smart. I make my money work for me. I am always looking and creating ways to create streams of residual income. My level of consciousness is conducive to creating high levels of wealth. I love the idea of me bring rich. I see myself being rich everyday. I look like a rich and wealthy person. I feel like a rich and wealthy person. I love the way it feels to get wealthy and keep my bank account growing. Money actually favors me and my pursuit for wealth. I have a positive and loving relationship with money. I love how great I can treat people with my abundant levels of money. My thought files support my riches and abundance. The more money I get the less I cling to it, which helps me create even more of it. I let go of my money scarcity mindset now and forever. I easily combine my passion with abundant financial rewards. I envision myself, right now, completely financially free. The more I act financially free, the faster I am making it a reality. I relish in the fact that I can master the game of money with ease. I attract complete financial freedom into my life with ease. Money to me is a tool that gives me complete financial freedom and helps me make a difference in the lives around me. Money is positive and is good vibrations. I create my own reality including my abundant bank account. I envision in my mind piles of money in my bank account. I see the numbers on the ATM slip being high 6 and even 7 figures. I envision with perfect clarity myself being completely stress free around money. I don’t operate from a place of wanting money, only HAVING money. I only ask “how can I afford it”, I never say “I can’t afford it”. I don’t sympathize in other peoples or my own money problems because I know I and they are creating their own reality. I will be financially abundant for all of my days. God gifted me with the natural ability to attract money into my life with ease. My friends and family love and accept my abundance completely. I inspire myself because I am so good with money and creating more and more of it. The more my money multiplies, the more my legacy grows. I live the life of my dreams with the money I earn. I am able to travel and complete all my bucket list items because of all my earnings, with much left over. I find money everywhere I go. I do not hesitate around money making opportunities, I act in perfect accordance with maximizing my opportunities to the fullest. I never talk about lack of money. I choose to be the master of my own financial fate. I am the captain of my own life and therefore steer my life always towards where financial abundance is. I know I only live once, and because of that I choose to be rich in this life. Money flows to me like it would a king or queen. I forgive my old self for not seeing money as a great thing, but now that old me is dead and gone and a new abundant me has taken it’s place. Money is the root of all greatness. I create deep roots in my financial earning ability thought learning and applying tools and tips from the masters. If I want something in life, I can afford it and have it. I am not attached to where my financial abundance is coming from. I just know it is coming to me and rest in this fact. I know that I am here to create abundance and live heaven on earth. I love how I can help people who can’t help themselves with the money I earn. I enjoy that I can create and share a big vision for helping people by recruiting even more rich people like me to partner and change the world together. I look forward to every day because I know my net worth keeps growing. I make money in my sleep with ease. My passion earns me hefty paychecks. I proved everyone who didn’t believe in me wrong by getting rich. I proved everyone who did believe in me right by becoming financially free. People never feel negatively toward me when they know I am rich. Richness is part of by core being. I surround myself with winners and people who achieve big in the financial realm. I surround myself with people who encourage me to reach my full money making potential. I love the people who don’t think abundantly but naturally get them out of my life because I know they aren’t beneficially to my financial freedom. I feel so successful all the time. Success and happiness flow to me with ease, more and more each day. I tap into money making abilities that I didn’t even know I had with ease. I am constantly reading money positive content online and offline. I follow the best people to follow who have mastered the money game like T. Harv Eker, Tony Robbins and Darren Hardy. I never see anyone as being superior to me in money making. I know we all have equal time to make money and I can do what they do. I share with the world my tips because I am not only interested in making millions, I also want to show the world how to see their abundant gifts. I don’t see money as dirty, or filthy. I see it as squeaky clean and ready to help me live abundantly. I choose to always see money in a positive light until my dying day. My confidence is sky high because I know I am financially free right now. I like the feeling of having complete power over my life because I am the master of the money game. I embrace new opportunities for income. I have perfection intuition about when to invest and take on new money making opportunities, as well as when not to. I am never content with how much I am worth as I know comfort keeps me in the same place. Money is my personal servant. I grow my income and happiness daily. I am perfectly comfortable with large sums of money coming to me and in my bank account. I know that the more people I help the more my income can grow. The actions I engage in help me manifest complete abundance into my life. Money and spirituality co-exist in my life with ease and perfection. I never feel guilty at all for making and keeping large sums of money. I serve under and abundant universe that doesn’t know lack, therefore I don’t know lack any longer. I know that pursuing and committing to being rich is not selfish, it is completely selfless. I release all my tension towards making large sums of money. I seem to have the Midas touch with money, everything I touch turns to gold! I am a great financial success. I prove myself right by showing myself that I can create financial abundance with ease. I prosper financially with all that I do. Money falls into my lap. I align with powerful and rich people and learn from them and implement what I learn to create financial freedom in my life. I literally feel wealth flowing to me each and every second of my day. I don’t let what people think about me get in the way of creating financial freedom and independence. My daily habits are cohesive with making large sums of money. I pay no mind to people who think or talk negatively about how much money I have as I know they are simply thinking from a lack mindset. That I used to have but no longer do. I am empathetic towards money as I know this is a powerful emotion. I love that I am building my future the right way and will retire rich. I enjoy my riches without any guilt. I have multiple bank accounts filled with money. People enjoy giving me money. I have tons of clients that love paying me for the value that I give them. I feel complete mastery over my finances and it shows up in an abundant bank account. The easiest thing for me to do is make hefty sums of money. I have completely reclaimed my money making power and abilities. I know that the universe wants me to be rich and that is why I am perfectly at ease with my riches. I am in perfect alignment with the universal laws of abundance. I truly believe that I can make billions of dollars. I see myself as a leader in the game of money. There is nothing I cannot buy or afford. I naturally replace negative money thoughts with positive money thoughts. My mind is running on auto-pilot in a way that attracts complete abundance into my life. I know I am not taking money from others if I earn more, there is plenty of wealth go to go around. My wallet is always full. I feel safe and secure physically even though I have so much money in my bank account. I live live on my own terms because of all the money I have earned and kept. Money is the easiest thing to make. I easily made the shift from poverty mindset to abundant mindset. There are truly no limits to my earning capability. The universe is always conspiring to make me completely financially free. I love growing my bank account daily! I instill unshakable positive beliefs in my mind around money. I never worry about paying for things for myself or family because I know I never have to worry about money again. So there we are my friend. 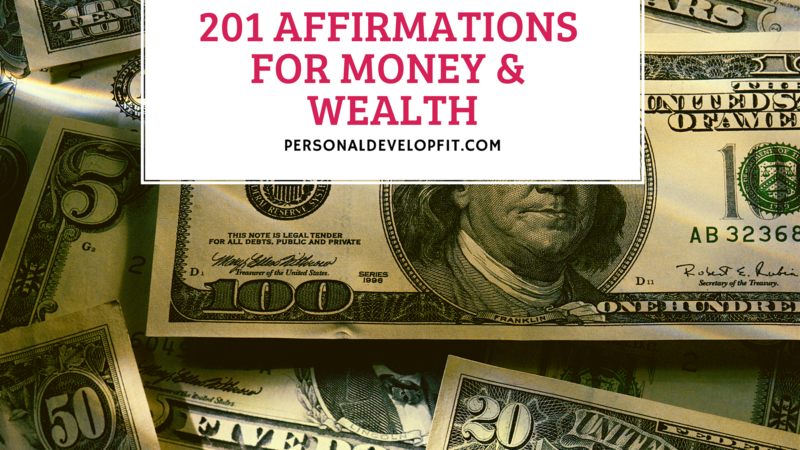 Money affirmations that can literally help you obliterate any negative belief you have every had around the benjis! Share with me what you thought about the list. If it is missing any good affirmations around money share with me ones that you have that aren’t on the list! I hope you got value out of this list and it helps you take yourself to the next level when it comes to wealth and life itself. I believe in you and know that you have the potential to live the life of your dreams. And to manifest massive amounts of money to change your life and the lives around you for the better, forever.